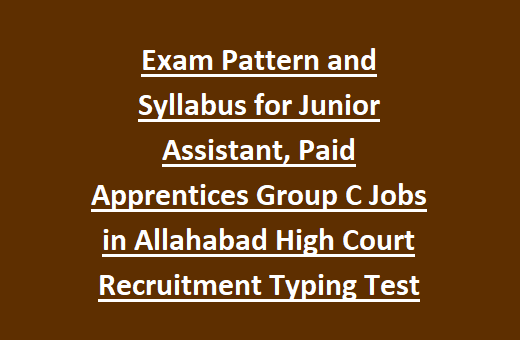 Exam Pattern & Syllabus for AHC Group C Jobs Recruitment 2018: Allahabad High Court invites online applications from the eligible candidates for the available Group C Clerical Cadre posts of Junior Assistant and Paid Apprentices. For applying these vacancies candidates must have qualified Intermediate or 10+2 with Typing knowledge on computer. Admit Card and Exam dates will be announced later. There are total 1484 vacancies in this AHC recruitment. For both the posts age limits are 18-40 years. 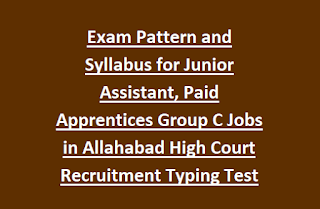 Selection for this Junior Assistant jobs of Group C Clerical cadre will be held in two different stages. Written Exam which is also called Stage 1 Exam will be conducted for 100 marks. Total 100 objective type questions will be given. Exam will be held on OMR Sheet only. Candidates who are qualified in Stage 1 exam based on merit list for available vacancies in 1:5 ratio candidates will be called for Stage Computer Type Test. There is no negative marking in this stage 1 exam. Exam Syllabus for these Junior Assistant jobs will be intermediate level only. Candidates who are qualified Stage 1 exam based on merit list 1:5 ratio Candidates will be called for interview. Computer Type Test will be conducted in Both Hindi and English Languages. For English typing candidate should have type 30 words per minute on computer.